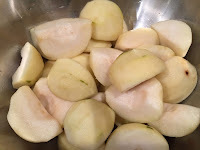 We are at the end of the pear season, but a number of the farmhouses near by still have cooking pears for sale on their honesty stands. I can't resist a bargain ( apparently a very dutch trait!) and I snagged a bag full of pears on a recent trip out.I have to admit I thought they were eaters and had a bit of a shock when I took a big bite out of the first one! Nonetheless, when life gives you cookers - let's make delicious desserts! 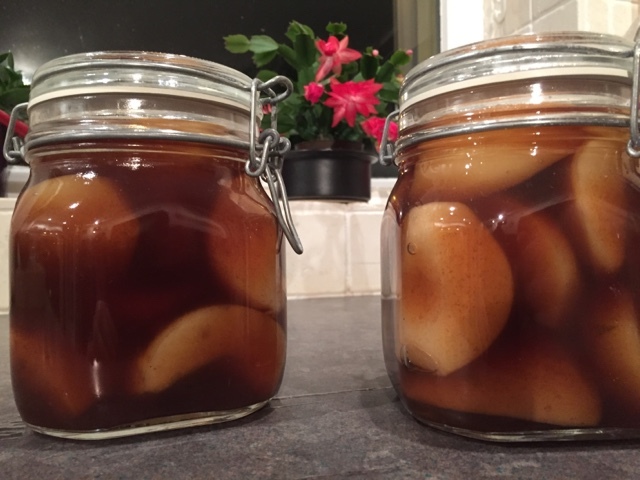 I decided to try my hand at making poached pears with a spicy christmas twist to them - and promptly ran into the challenge of needing red wine for all the recipes. I don't tend to drink much wine, so I don't often have a spare opened bottle kicking around so I improvised. Peel, quarter and core the pears. Rinse quickly and then put into a pan on a gentle heat. 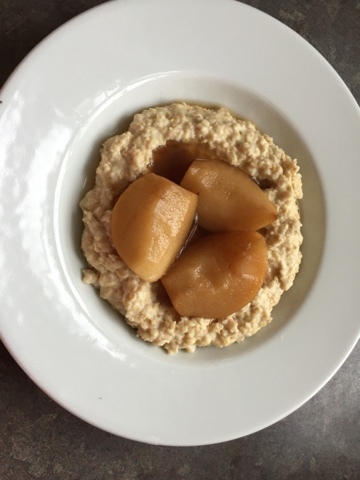 Cover the pears with water, add the sugars, spices and 'appelstroop' and stir gently. Simmer very slowly for about 30-45 minutes, or until the pears are soft & gently colored. 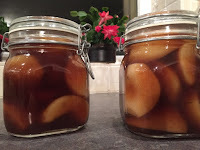 I keep my pears in clip jars - if you plan to keep them for a long time you need to sterilize the jars by placing in boiling water in a saucepan for about 5 minutes. As they don't last too long around our house, I just pour in hot, cool with the lid clipped down to form a seal, and keep in the fridge. They are lovely warmed through and served with yoghurt or cream. W loves them for breakfast as topping for his porridge. Or you can serve them as a side dish with pork based main courses. 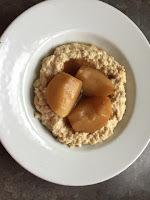 However you eat your pears - I hope you enjoy them and they bring back a whisper of summer! My mother makes these and they're delicious.